So, I cannot explain it. Wish I could. Cannot see how it could have been a joke. The Myers Briggs test indicates I am a thinking introvert.....and so the fact that I cannot explain this mystery-beyond science fiction bothers me. In the bowels of Kennedy Space Center, in the tunnels, the chases of the VAB, the vaults of the Launch Control Center and launch towers are literally thousands of miles of cables. 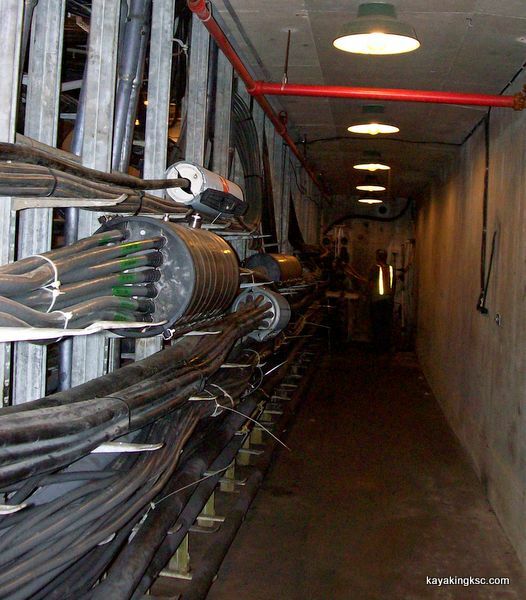 The backbone of ground communications; cables connect buildings and towers through a skeleton of over 600 manholes, giant tunnels under the crawlerway & blast tape wrapped cables up the launch gantries. 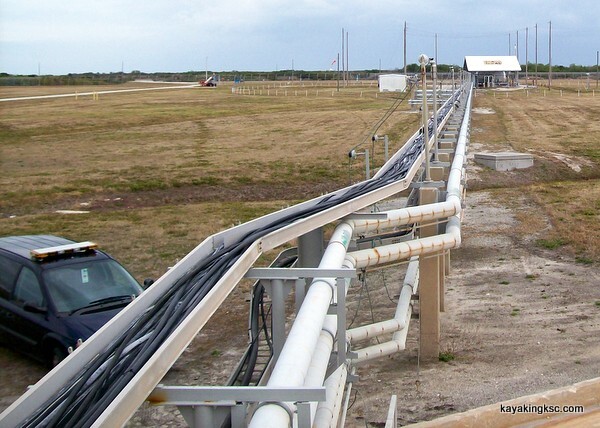 Like everything else on KSC, the amount of copper and optical fiber cabling is impressive and huge. Huge air compressors spread across the space center kept cables dry from Oak Hill in the north to the Barge Canal in the south. 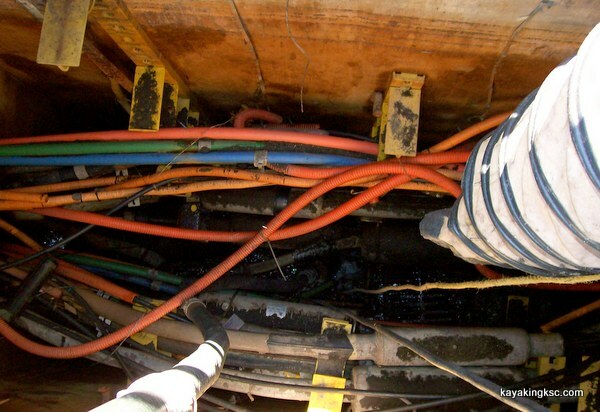 Strategically placed around this conglomeration of cables were 7,000 transducer air pressure alarms that gave an instant warning when the pressure slipped below certain limits and a team was dispatched to investigate. What monitored the 7000 alarms, the guardian of air pressure was the space center computer known as FRED. From a science fiction point of view, Fred was an older computer connected to a thousand+ mile coil of cable which were hardwired to 7000 (eyes and fingers). An Incalculable amount of data for the Space Shuttle program was transmitted and received via this cabling. In addition; electronically and physically this giant coil was connected to the adjoining air force base with an equally impressive amount of pressurized cables. A living breathing vast coil of copper on the east coast of Florida. Was it alive? Of course not. That would be sci fi or pure fantasy. Anyway, there came a day when my supervisor came to me and explained "Fred is no longer needed, when you get caught up on your work load write a work order to turn Fred off and send his parts to the salvage yard." Little explanation: I work at my own pace to complete a never ending series of communication projects around the space center. It is aGreat Job! And I take pride in a job well done. 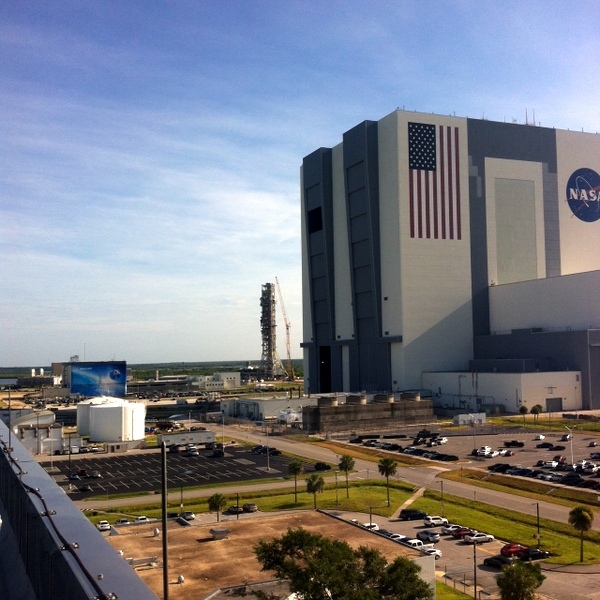 Some tasks get high priority; for example when President Obama or Vice-President Pence visited Kennedy Space Center. Other tasks have a very low priority ranking,(whenever you get to them) like turning off Fred. The powering down Fred could take years-no hurry and had the lowest of priorities. 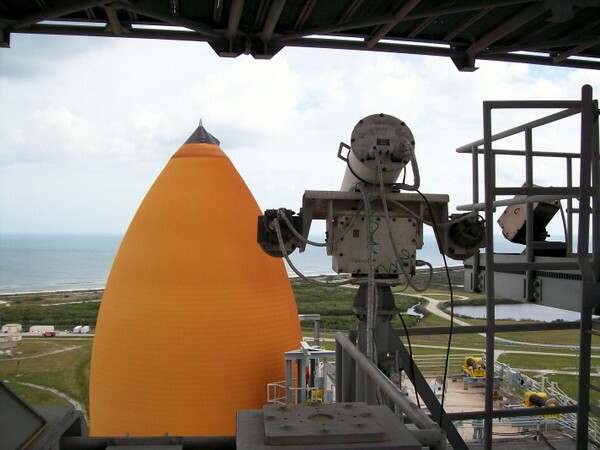 Fred had ever so slowly, one cable at a time had become obsolete: as the cables under the space center were replaced with modern cabling that did not require costly air compressors to keep moisture from interrupting communications across the center. Fred had fallen from the great height of being one of most important computers on the space center to simply another old computer taking rack up space. Almost sad but that is technological age we live in. Last space shuttle as launch as viewed from Mosquito Lagoon. As the shuttle fleet retired, FRED became obsolete as a mammal drawn wagon. So it was about four months later, with me temporarily caught up on other projects; I walked into the building to inspect and write up the task to turn off and salvage Fred. Important note related to this story: Because I work at my own pace, I had not told my co-worker my daily work plan (he had his own list of work) & also had not told my manager- she was busy with more important subjects to consider- keeping KSC connected to the world (and above) and communications working error free. Late autumn in Florida, almost jacket weather, but not quite as I parked my work van & grabbed my notebook. Scanned my identification to get access into Fred's building and stepped inside the artificial lighting. The building, as normal was unoccupied. My footsteps echoed across empty hallways. I went to Fred's cabinet, inspected what it would take to write up to have the electrical cables powering Fred removed (Kill Fred) and cut the copper cables that connected Fred to the entire space center (Blind Fred). And send the components to the salvage yard for resale (Bury Fred) Even remove the communications rack upon which Fred was secured (Remove Fred's grave marker) as if he never existed. Stuck to cover of my note book was a phenolic label with four letters "Fred"
I looked at the label for a long, long time. Not only had I never seen the label before; the FRED label had not been on my note book when I went into the empty building. I had never set my note book down nor leaned against anything while inspecting Fred. So where had the label come from? Who made it and who had stuck it to my notebook? I have no explanation. None. Cannot even offer up a good BS statement. Note on the label: It was a common peel and stick label that is used throughout Kennedy Space Center. They are hand cut and hand crafted. No way to know how old the label was. Ten days or ten years. As mentioned, I looked at the label for a long, long time. I used the notebook for a long time, often pointing to the novelty of the sticker with Fred's name and explaining how it mysteriously came to be on my book. I mean come on......Ridiculous Story. 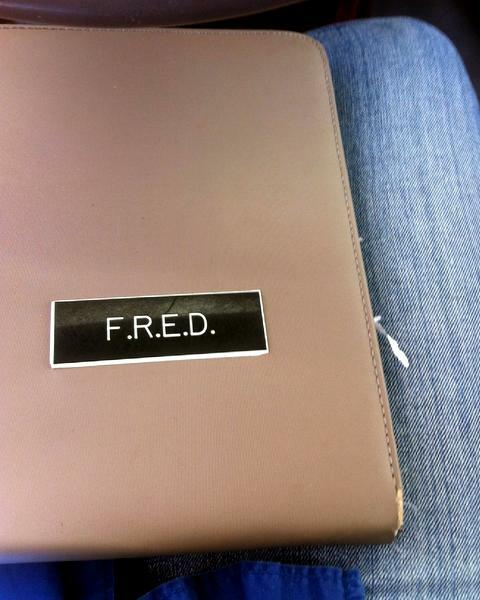 But I still have the notebook and the Fred label--both collect dust now. I told my kids this story of Fred and the first thing they asked "Did you go ahead & Kill Fred"
"Of course I did" was my reply. I do not believe in Ghosts or ghosts in the machine. Everything has an explanation. 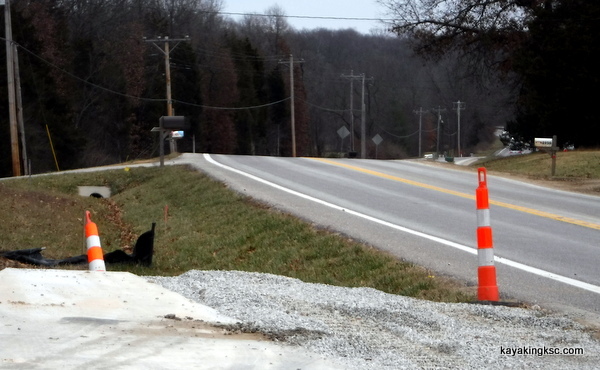 ---Just irks me that I do not have an explanation for this mysterious Fred label.